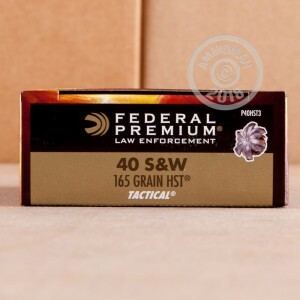 Federal HST ammunition delivers superior terminal performance designed to meet law enforcement test standards. 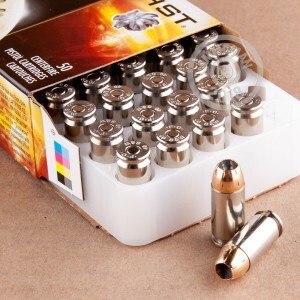 Packaged in an economical 50 round box, these .40 S&W cartridges fire a 165 grain jacketed hollow point bullet with a skived tip designed to produce deadly six-petal expansion that will stop an attacker in his tracks. When you're forced to defend yourself, this ammo won't let you down. This ammunition is loaded in Anoka, Minnesota using non-corrosive Boxer primers and nickel-plated brass cases that will withstand the rigors of daily carry. 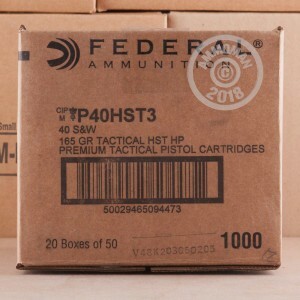 Grab a few of these boxes to fully test this ammo in your gun or peruse the rest of AmmoMan.com's selection. Remember, all orders over $99 ship for free!